Tony Martin: Rotherham Council stoop to new lows in their bid to sweep the grooming scandal under the payer mat. Rotherham Council stoop to new lows in their bid to sweep the grooming scandal under the payer mat. 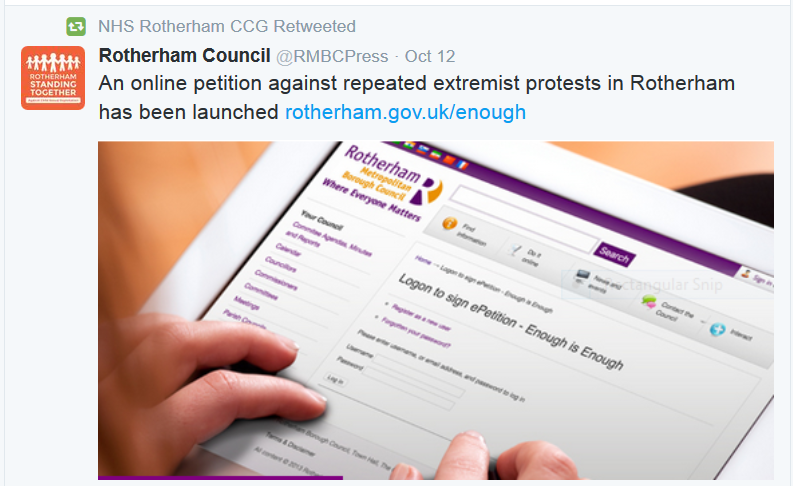 Rotherham also known as Rotherstan Council have launched a petition on their Tax Payer funded website, with the aim of stopping Peaceful and Lawful protests in Rotherham. The petition which completely misses the point that the police are the ones deliberately causing the disturbances at these demonstration and that there is no need to shut shops and businesses. I include a video of a Rotherham demonstration from last year, which show the police marching protesters around the town centre in a bid to keep them away from the town hall and the protesters being well received by the good people of Rotherham. Not only are the council using the home page of their website to promote this attack on basic democratic rights but it is also being promoted on their Twitter account along and on what appears to be the Twitter accounts of South Yorkshire Fire and Rescue and NHS Rotherham. I have set up a petition demanding that ‘council websites should be used to advise and help the public not as a campaign tool asking members of the public to sign petitions’ please take 2 minutes to sign the petition bellow.